This new museum designed by Sparano + Mooney Architecture houses a permanent collection as well as a continually rotating exhibit depicting the history of this area of Los Angeles County. The program includes gallery spaces, a multi-purpose room and archival area, a curatorial office, and both interior and exterior exhibition spaces. Clerestory windows and focused views provide natural light to the galleries. Views of the nearby San Gabriel Mountains are incorporated into the exhibit as the historical is juxtaposed with the present. Relationships to the site and existing community center west of the museum are created through geometric and material references to the context. Sustainable design elements include an FSC (Forest Stewardship Council) certified wood exterior screen, passive solar design and orientation and shaded areas with overhangs. The modern museum design was inspired through an in-depth analysis of the complex relationship between the historian who records the past and the museum visitor experiencing the present. Central to this relationship is the notion that history is understood through second and third generation sources or filters. The design process began with the development of a conceptual viewing apparatus, which explored the impact of these filters on what and how history is experienced. This construct was translated into an architecture that changes dramatically based on the position of the observer. 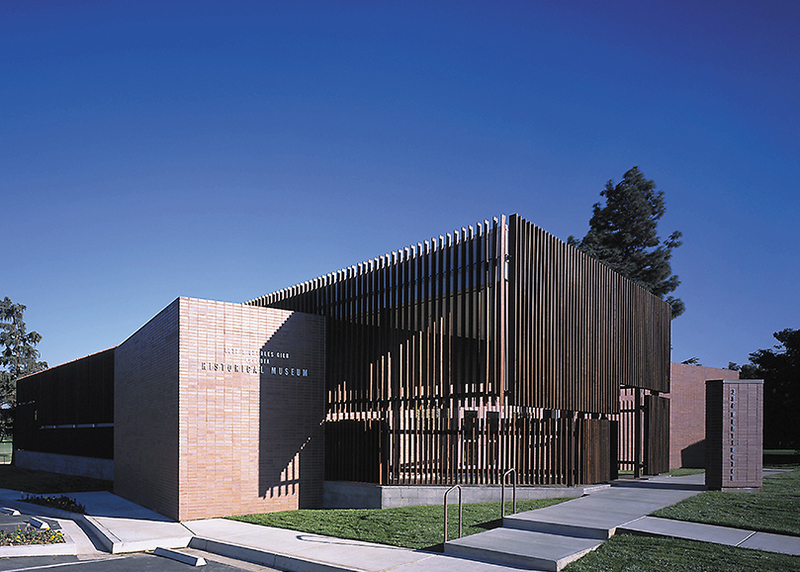 When viewed at a right angle, the facade dissolves as one looks through the wood louver screen; at an oblique angle, the facade appears solid. The idea extended into the development of the exhibit design which assumed a hyper-flexible and democratic approach, incorporating changeable elements including chalkboards for changing texts, corkboard frames for rotating displays, and movable open display cases which transform the space by their location, and invite hands-on interaction with the collection. This project earned recognition in numerous publications in the US and abroad and has won design awards from the American Institute of Architects at the local, state, and regional level.